There is already some good article written about installing NodeBB on different environments. One of the easiest was from Andrew Rodrigues, co-founder of NodeBB, itself. But that seems to be old and there are many points which should be updated now. I will extend that article more or less. Feel free to inform me if anything needs attention. *Disclaimer: That’s a referral link. But if you sign up DigitalOcean using my link then you will also get $10 credit. This credit will be enough for 2 months hosting. Let’s install NodeBB on tiniest DigitalOcean server with 512Mb RAM. Even this droplet (the server) will be good to start. You can scale it anytime or as required. You may leave all other options intact OR change as per your need. 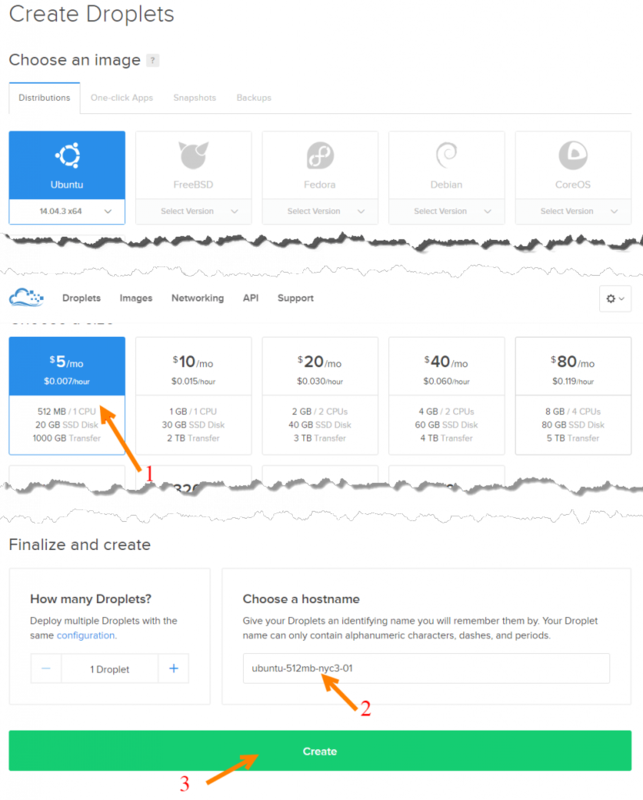 DigitalOcean will send you an email with login credentials upon successful droplet creation. We will need these credentials to login to the droplet via SSH. To log into your server we need a tiny software called PuTTY. It’s free and can be downloaded from here. (Simply download PuTTY for For Windows on Intel x86. It will work fine on any Windows OS. Linux and Apple users do not need PuTTY. PuTTY window looks like the screenshot above. Simply enter IP Address (as provided in DigitalOcean email), port 22 and select connection type SSH. Once you hit open you will be connected and asked for login as. Enter root as your username and then password (the one you received in email). Now, run the following commands to add a user of your choice. I have used bill for this tutorial. (Do not copy the # or $ sign from any of the following commands. Also do not change directory unless your are told to do so or you are sure about it. You will be asked to enter a few details about username bill. Except password leave other options blank and hit enter. Once the user is created run the following command to give it superuser privilege. Now, logout with the command logout. It will update the packages but take a few seconds to complete. After completion run the following command various software and dependencies including git, nodejs, npm, redis-server and nginx. Notice the backticks in the above command. It’s not single colon. Now we have completed installing all the dependencies for NodeBB. So it’s time to install NodeBB but first create a directory for it. In the tutorial we will install our forum in a dedicated directory called forums. You may change it to what so ever to identify easily. Now, the prompt will be like this: [email protected]:/var/www$. It’s time to change the ownership of the directory to bill. 15/12 01:50  - error: Your Redis version is not new enough to support NodeBB, please upgrade Redis to v2.8.9 or higher. To fix the above issue we have to upgrade redis to a later version. Add chris-lea/redis-server repository with following command. The repository is recommended by NodeBB itself. As you have seen it it really easy to install NodeBB on DigitalOcean droplet we will configure Nginx to act as NodeBB Proxy in the next post. If you face any issue leave a comment below or want to take a preview of a NodeBB forum on 512MB DigitalOcean droplet head to our forums. It’s pretty new and I would appreciate to leave a comment or join our forums.